FILE - FBI Deputy Director Andrew McCabe holds a press conference in Washington July 20, 2016. Former FBI deputy director Andrew McCabe, who stepped down in January after criticism from President Donald Trump, met Thursday with a U.S. Justice Department official in an effort to preserve his pension, according to a source familiar with the matter. McCabe planned to retire Sunday with full benefits, but some or all of his pension could be at risk after the Federal Bureau of Investigation's Office of Professional Responsibility recommended firing him for misleading Justice Department investigators about his supervision of probes into Hillary Clinton, Trump's presidential opponent, said the source, who requested anonymity. The person spoke anonymously because no decisions have been made, and the matter is still not public. McCabe did not return a call seeking comment. Sunday is McCabe's birthday, which triggers his eligibility for full pension benefits, the source said. Attorney General Jeff Sessions is out of town Thursday, so McCabe met with a person in Deputy Attorney General Rod Rosenstein's office to make his final appeal in a meeting that lasted more than three hours, the source said. The person spoke anonymously because no decisions have been made. 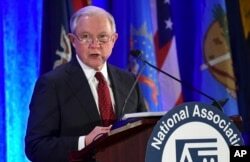 FILE - U.S. Attorney General Jeff Sessions speaks at the National Association of Attorneys General Winter Meeting in Washington, Feb. 27, 2018. McCabe, a 20-plus-year FBI veteran and lifelong Republican, has been a target of Trump and others who have questioned whether his role in the investigations was politically biased or compromised because his wife, a Democrat, got donations for her Virginia state Senate campaign from Virginia's then-governor, Terry McAuliffe, a close ally of the Clintons. If Sessions fires McCabe, he could be accused of bending to the will of Trump, who has attacked McCabe on Twitter for his role in the Clinton investigations while his wife received donations from what Trump called "Clinton Puppets." But if Sessions allows McCabe to stay until his retirement, he could face a backlash from conservatives who have attacked the FBI. When asked about it Thursday, White House spokeswoman Sarah Huckabee Sanders said the decision is up to Sessions. However, she also called McCabe a "bad actor" and said it is "well documented that he has had some very troubling behavior." It is unclear what will determine if McCabe can retain all or part of his pension if he is fired, the source said. In general, the impact of a person's termination depends on facts and circumstances, according to a Justice Department spokeswoman. The recommendation to fire McCabe was based on a report by the Justice Department's inspector general, which according to the source says McCabe misled investigators about his communications with a former Wall Street Journal reporter. McCabe denies misleading them in any way. On two occasions in 2016, McCabe authorized an FBI public affairs officer to talk to a Wall Street Journal reporter who was writing about McCabe's role in probes related to Clinton, the source said. The FBI has said that at the time McCabe got involved in one of the probes, into Clinton's use of a private email server, his wife's election campaign was over. One article that discussed McCabe's role in the investigation into the Clintons' charitable foundation claimed some agents thought McCabe was trying to quash the probe, which McCabe said was not true.